The multimedia news leader in Washington since 1996. FedNet (http://www.FedNet.net) is a credentialed news organization and the leading provider of multimedia content of the United States Congress. FedNet maintains a robust video network throughout the Capitol complex for use in broadcast and web-based production. FedNet began broadcasting Congress on the web in 1996 and since that time has broadcast over 10,000 live hearings and press conferences and complete, gavel-to-gavel, live coverage of the Senate and House Floor Debates each day. FedNet’s reputation for solid, innovative products and quality production of footage for a wide client base has persisted. Whether on-site with a camera crew or capturing and processing content, FedNet’s capabilities at the intersection of Multimedia production, the federal government and Congress have been sought after by a range of clients including, Roll Call Newspaper, The Los Angeles Times, Tribune Publishing, McClatchy Newspapers, Tribune Broadcasting, The Washington Post, the National Academies of Science, The Robert Wood Johnson Foundation and others. In 2002, FedNet launched a proprietary searchable video database, providing timely, searchable access, retrieval, editing and posting of streaming coverage from the Senate and House Floor Debates since. Over four million clips currently exist in our database and users have access to over 40,000 hours of archived video. Every spoken word from January 2002 through today is available through the service and all live content is ready for searching, editing and posting to websites, e-mails and electronic releases within ten minutes of the utterance to quickly and efficiently post streaming video content through an easy-to-use web based interface. This service was sold to Congressional Quarterly (CQ) in 2007 and is currently managed by FedNet. 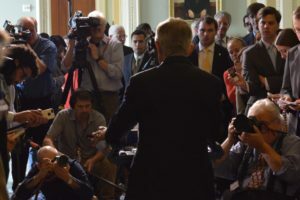 In 2012, FedNet released VUGUV, the first committed mobile streaming video of Congress. FedNet has provided video for any screen since that time. Copyright © 2004 - 2019 · Federal Network, Inc. All rights reserved.